This past weekend I was on a weekend cruise to the Bahamas for my cousin’s bachelorette party. (I know, decease life is hard.) Cruises mean food 24 hours a day. Breakfast buffet, snack, lunch, snack, 3-course meal, the bar and late-night pizza. All in all, more food (and beverage) than I’m used to. So, this week is all about detox for me, and I made this super tasty chopped salad with a slightly sweet miso dressing. I felt healthy just looking at it…and eating it was was no chore either. A chopped salad is so much more pleasant than one with big, chunky toppings. Especially when you eat it at your desk and your office has no walls. Much neater. This salad starts with some baby spinach, small enough that chopping isn’t necessary. 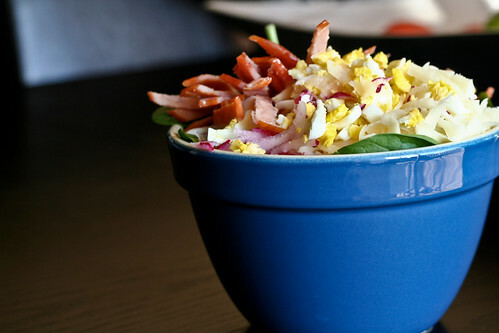 Pile on your favorite chopped veggies and proteins — radishes, hard-boiled egg, Canadian bacon, Havarti cheese and carrots in my case. Then drizzle with a little miso dressing and dig in. I’m posting this salad and others this week as part of The Cruise Cleanse. Stay tuned for Taco Salad later this week. Use your favorite salad toppings here…anything goes. Artichoke hearts would be good, so would sunflower seeds, roasted red peppers, green onions, hearts of palm, etc. Whisk the olive oil, vinegar, miso paste and honey together until miso paste is completely dissolved (or use your immersion blender). Assemble your salad ingredients and toss with the dressing. Serve immediately with soup or a whole grain roll. Makes 2 big salads, 4 smaller salads. Have never put miso in a salad dressing but I bet I’d LOVE it. Why have I not made a chopped salad instead of those chunky messes I’m prone to make?! Thanks for the heads-up :) Now my coworkers won’t hear me nosh so loudly in my cube. An all-vegetable diet is in order after most holidays for me. All that butter-laden, sugar-filled, deep-fried overeating reeks havoc on any digestive system. Love the miso dressing. Always on the lookout for more recipes to use up that big hunk of miso in my fridge. Miso was made for salad dressings. This salad sounds really good! There is a Japanese place by my apartment that I get takeout from at least once a week, and they have THE MOST delicious miso dressing. I wish I could replicate it, but I have no idea…. this sounds like it could be a good match!! I love miso dressings but have never made at home. I have all the ingredients though, so the next time I make a salad, I’m going to try this one. Thanks!